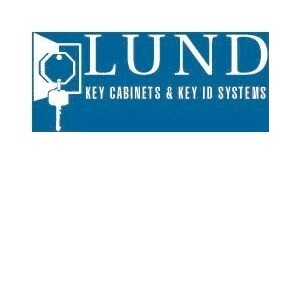 Lund manufactures more than 70 different styles of key cabinets and panels, complete with systems for controlling keys. Standard key access boxes include mini-wall cabinets, flush-recess cabinets, floor model and vertical cabinets. Lund key cabinets are well known for quality and craftsmanship since 1940, when the company was founded by E.J. Lund. Browse the Lund Catalogue of Key Cabinets. D-Line Special 4 ½” Row Key Cabinets - for large number of auto keys . Mini Wall Cabinet, one tag system. Supplied with 2 tag key system which includes 2 tags per hook, hook lables & sheilds, key receipt cards & envelopes & book index. Supplied with 2 tag key system which includes 2 tags per hook, hook labels & sheilds, key receipt cards & envelopes & book index. Floor Cabinet with two tag key system "Non stock, call customer service for delivery"
Envelope Cabinet, 125 capacity. "Non stock, call customer service for delivery"
Big head key cabinet, 210 capacity. "Non stock, call customer service for delivery"
Deluxe Wall Cabinet, one tag system.